The ColdCure® Top Shoulder Wrap is designed to relieve the pain, swelling and inflammation of soft tissue injuries in the top of the shoulder. This includes Rotator Cuff injuries, Supraspinatus and Infraspinatus Tendinitis, Frozen Shoulder, and repetitive strain injuries. Muscle, ligament and tendon tissue injuries can all be treated with a ColdCure® Top Shoulder Wrap. 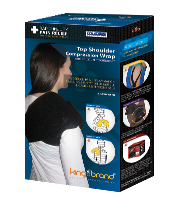 The Top Shoulder Wrap comes with three swappable gel packs that are custom designed to conform to the shape of the top of your shoulder. The unique design of these gel packs ensures the best treatment and coverage possible. The wrap molds the gel pack around your scapula, collar bone, rotator cuff, and the top of your deltoid, to ensure your entire injury receives an even distribution of cooling power. We have two different Shoulder Wraps that target two different areas. 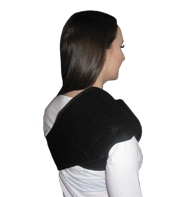 While this page is dedicated to the Top Shoulder Wrap, we also have a Side Shoulder Wrap. Generally speaking, if you have a Supraspinatus or Infraspinatus injury, or a case of Frozen Shoulder, you should use the Top Shoulder products. If you happen to have Upper Bicep Tendinitis or a Deltoid injury, you should use the Side Shoulder products. It all depends on what area you need to target. Rotator Cuff injuries are a bit more tricky, as it depends on which part of the Rotator Cuff is injured. Pay attention to where the pain is. Is it closer to the "top" or "side"? 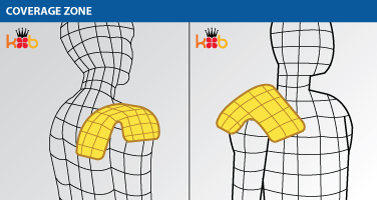 Use the coverage zone image above to determine if the Top Shoulder Wrap would cover the painful area. The three massive gel packs included with the Top Shoulder Wrap are also significantly larger than store-bought packs, meaning they cover more of the injured area.